Heat olive oil in a Dutch oven over medium-high heat. Add chopped onion, celery, and chili powder; sauté 3 minutes or until tender. Stir in water and next 4 ingredients (water through tomatoes); cook 10 minutes. Add fish; cook 3 minutes or until fish is done. Stir in parsley. * Can use 1 Cup of fish stock and 1 Cup of water. 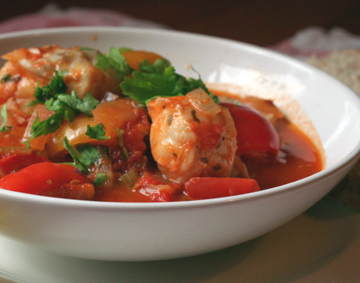 This entry was posted in Entrees, Metabolic Medical Center Recipes, Modified Profast (Fast and Flexible) Recipes, Seafood, Soups and tagged easy, fish stew, fish tomato stew, Metabolic Medical Center Recipes, red fish soup, seafoos stew by foodies4mmc. Bookmark the permalink.